Hi, welcome back! I’m getting close to wrapping up the California Vacation Adventures Series. 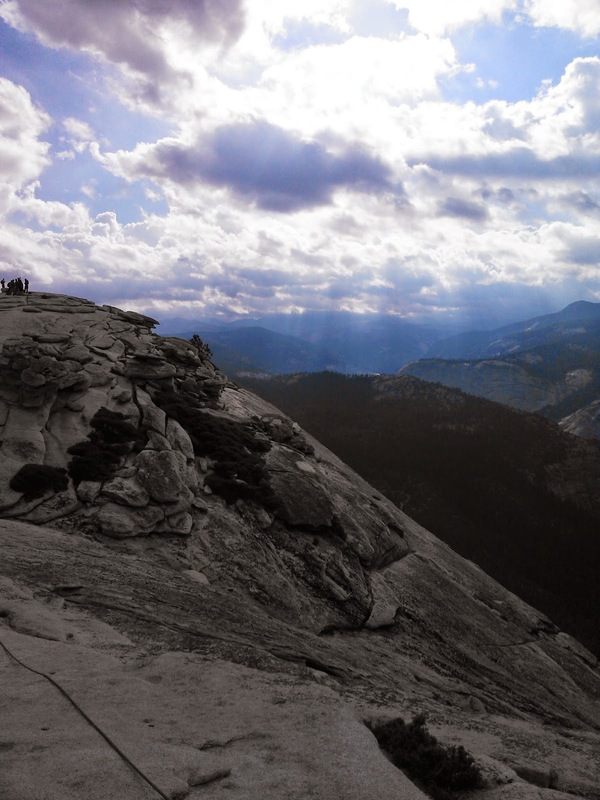 Today’s blog post will detail our hike to Half Dome at Yosemite National Park. This is how bad the queue can get going up the Half Dome cables. I pretty much panicked when I saw this photo. I started watching and reading everything I could find on summitting Half Dome and the Half Dome cables. I had no idea how I was going to climb the cables. First of all, I’m scared of heights and second, this looked way outside my skill level. I knew how badly Nick wanted to do this though, so I did as much research as I could so that I felt prepared. The next obstacle, after overcoming my initial panic, was obtaining a Half Dome permit. 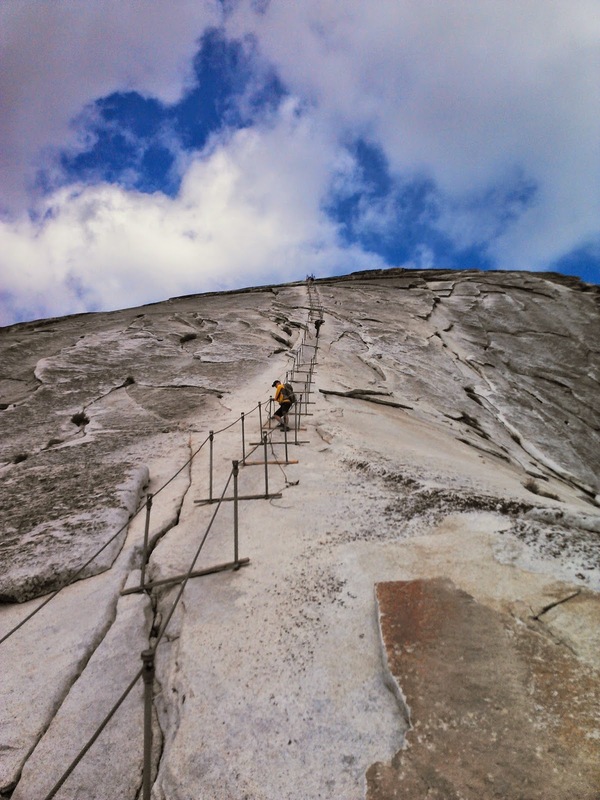 A maximum of 300 people are permitted on the Half Dome cables everyday. The NPS has an open season for permits which happens in March. Fortunately, they also have a daily lottery for permits for last minute hikers. There are approximately 50 daily lottery permits available. The daily lottery has an application period two days prior to the hiking date with a notification late that night. You can apply for the Half Dome lottery permit at Recreation.gov. The application fee is $4.50. This covers everyone in your party (up to a maximum of six people). If you win the lottery, each person is then charged an additional $8. Our first lottery attempt was unsuccessful, but on our second try we made it through! Now knowing that we were definitely hiking Half Dome, we had to find somewhere to stay that was closer to Yosemite. We had stayed in Fresno, CA the night before our first day at Yosemite– we just left super early in the morning to get to the park. But hiking Half Dome meant being on the trail well before the sun came up. The NPS suggests that it can take 10-12 hours to tackle the 14-16 mi round trip hike up (and back down) 4,800 ft. Based on our previous hikes, we didn’t think it would actually take us that long. The bigger driving factor to leaving before dawn was to avoid the heat and to avoid having a line of people waiting to use the cables. Elevation Profile for day hikes in Yosemite Valley. 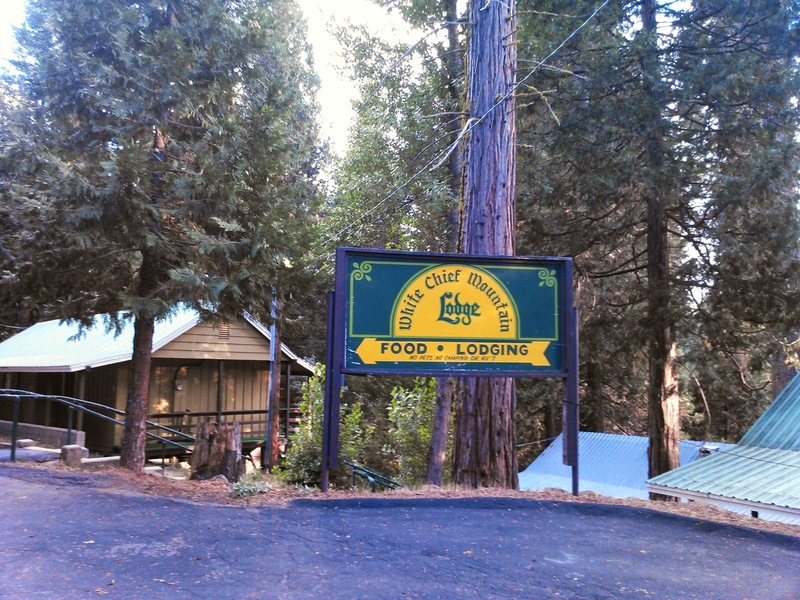 We were lucky to find the White Chief Mountain Lodge right outside Yosemite. The hotel was a little pricey for the size of the room; but the location was perfect, the room was clean, the place was quiet, and the guys at the front desk were really cool and were able to give us some good information about our Half Dome hike. The plan was to be on the trail at 5:00am. This meant that we got up at 3:15am. You might be wondering “Why so early? ?” Well, although the White Chief Mountain Lodge was right outside Yosemite, it took about 45 minutes to reach Yosemite Valley and the Mist Trail trail head. I don’t generally do very well eating at that time of day, but I knew it was critical for me to get a good breakfast before we started the hike. I was able to eat some cereal, fruit, and a Cliff Bar. We pulled into the parking lot at exactly 5:00am. There were roughly 10 other people starting the trail at the same time as us. It was so cool to be at Yosemite before dawn. The stars were still out, and your could see the outline of the mountains surrounding you. We got our flashlight out and we headed for the trail! There are two ways to get to Half Dome. Both start out on the Mist Trail, but a little over a mile in, you can hop on the John Muir Trail. Eventually you have no choice but to get on the John Muir Trail, but hiking the Mist Trail will take you right by Vernal and Nevada Falls. 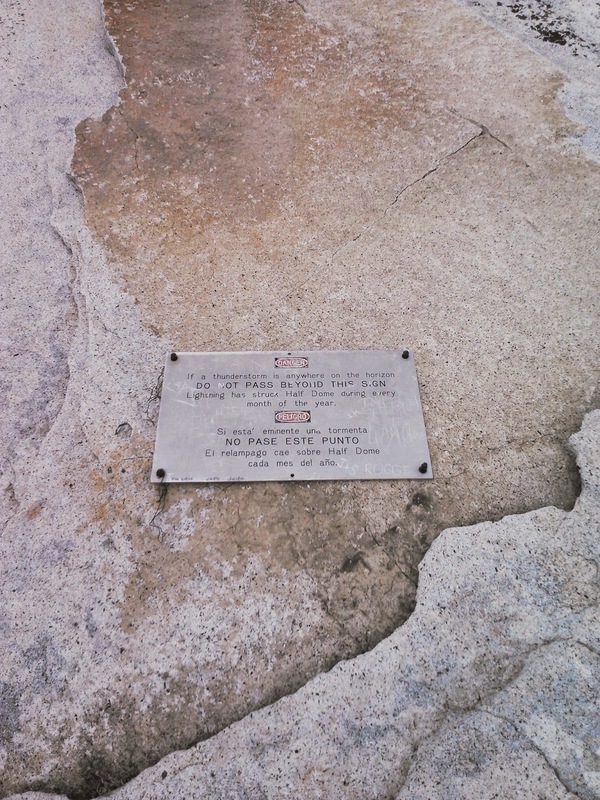 The first mile of the Mist Trail was paved. It was also steep. At 0.8 mi you pass the Vernal Falls footbridge. Yosemite makes sure that you know that the water fountain at the footbridge is the “last clean water source”. From here you continue approximately 0.7 mi up a steep granite stairway of over 600 steps. We reached the top of the 317-ft Vernal Falls in under an hour. It was getting light out as we were climbing the granite stairs. I wish I would have gotten more photos, but there were definitely points where I needed two hands, or needed to hold on to a railing that the NPS thankfully installed. Stairs to the top of Vernal Falls. Found this on Google. Not my photo, but shows a really tough part of the stairs to the top of Vernal Falls. Thank you, NPS, for installing a railing! I had never really seen a water fall up close before. I saw Niagara Falls once when I was in 5th grade, but that’s it. I was awestruck. The falls were definitely not at their peak capacity (I don’t think August is a good time to see water falls in California), but it was still magnificent. Awestruck by Vernal Falls. Even in partial darkness it was beautiful. We kept climbing, and had a beautiful view of the 594-ft Nevada Falls. In order to head to Half Dome though, you need to switch to the John Muir trail so we didn’t see the top of Nevada Falls on the climb up. I need to mention that at this point in our hike there were no longer any other hikers around us. We passed them all. And stayed ahead of them. We ran into a group of hikers not long after Nevada Falls. That group had been hiking since 4:00am and we passed them. They made the comment that we were moving really fast. This ended up being a theme throughout the entire hike– we had a lot of other hikers tells us we were moving quickly. It definitely made me feel good about my athletic ability. Nevada Falls from the Mist Trail. Me in front of Nevada Falls. Only 4.5 mi to Half Dome! Once we were on the John Muir Trail there was about a mile of trail that was relatively flat. This was a nice break from climbing. On this stretch of trail you go straight through Little Yosemite Valley Campground. This is a backpackers only campground meant, mainly, for hikers trying to break up their hike to Half Dome or Merced Lake High Sierra Camp. From this point on there really wasn’t anything exciting until you got about 1-0.5 mi from the subdome. It was a lot of trees, fallen pine needles, some rocks. You could tell when you were getting close to the subdome. Suddenly the trees started getting thinner and you were walking on granite slabs instead of the pine needles. Although you could tell you were getting close, it was like the subdome just snuck up on you. We were walking along talking and suddenly there was a park ranger in front of us ready to check to see if we were on the list. Getting close to the subdome! Park ranger making sure climbers have permits. We finally made it! It took approximately 3 hours to make it to the base of the subdome. There’s no turning back now! We started our climb up the steep granite stairs (if you can even call them stairs) of the subdome. There are no railing, and really not much of anything to hold on to unless you sort of crawl up the steps– which I did at a few points. It’s pretty much straight down on either side of you as you climb. Granite stairs leading up the subdome. Now, if you remember, I already said I’m afraid of heights. I definitely thought seeing the cables and steepness to climb the remaining 400 ft of Half Dome would do me in; but I definitely underestimated the difficultly of climbing the subdome. From the base of the subdome, you have 900 ft remaining to summit Half Dome– 500 ft of the subdome and 400 ft climbing the cables. We passed some hikers coming down the subdome pretty much right when we started and they said “The mountain is yours!” After they were past us, Nick said, “Literately, I think the mountain is ours right now. I don’t think there’s many people in front of us.” At this point, I’m sort of freaking out. My legs are feeling wobbly, there’s nothing protecting me if I fall, the steps are all different heights. I kept telling myself not to look down– just take it one step at a time, keep moving up. This worked for a while. We were about 3/4 of the way up the subdome when suddenly the stairs were gone. I really freaked out. I had no idea which way to go. There was no obvious trail leading up. I started looking around and realized how unprotected we were standing there. I found a little rock enclosure and sat down. I needed to take some deep breaths. Nick did some scouting of the path and found out that we were actually just supposed to keep going straight the way we came– right over a steep slab of granite. Well, I couldn’t do it. I just couldn’t. I started to cry right there. I was scared and disappointed in myself. I felt trapped– I can’t go up, and going down almost looks worse at this point. Now there were also more people coming up the subdome too. This just added to my stress because now I had people that I had to some how get around. View of Yosemite Valley from the subdome. I didn’t want Nick to miss out on the opportunity to climb the Half Dome cables. He initially offered to walk back down the subdome with me so I could wait for him. But we were really really close to the top of the subdome. Instead he helped me find a good place to sit and wait. I ended up finding a better rock enclosure so I could feel “tucked in” and safe while I waited. Nick is really good at everything so I thought he’d be pretty quick getting up and back down to me. He made me promise not to move from that spot. I wasn’t supposed to try to go down by myself. If I felt really scared I was supposed to ask a stranger to sit with me for a moment and talk to me to distract me. Sounds kind of funny now, but at the time it made total sense. Nick giving me instructions for while I wait for him to climb the rest of the dome. Right before Nick set off to climb alone. So, I sat and waited. I made a video blog of the scenery and how I was feeling at the moment. I tried to enjoy how beautiful the surroundings were, but in all honesty I was scared the entire time. I kept thinking that something bad could happen while Nick was climbing. 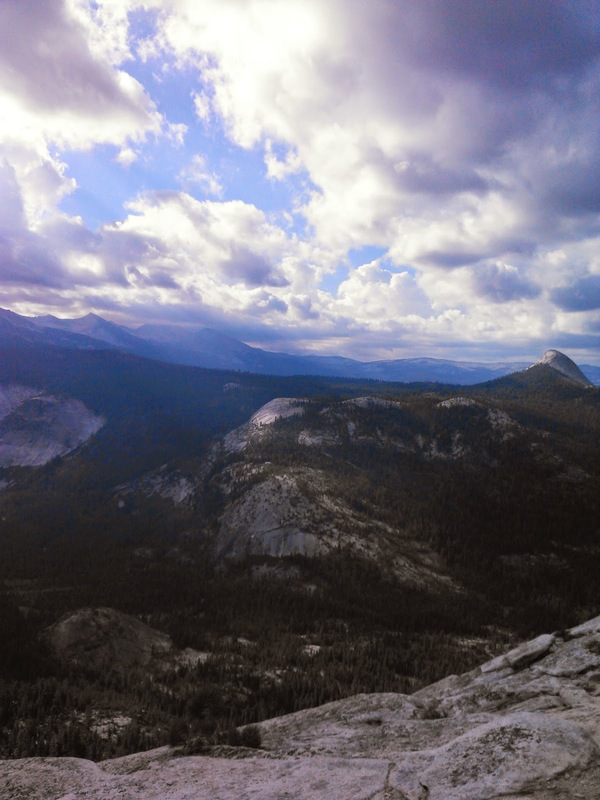 Video blog from the Half Dome subdome. Approximately 20 min passed when I suddenly heard someone saying my name. It was Nick! He was back and safe. When I saw that I hadn’t been sitting there for too long, I commented that he was really fast. A disappointed Nick responded with, “Well, I didn’t make it all the way.” I already mentioned that Nick was really good at everything, so to me this meant that the Half Dome cables were extremely difficult. Nick on his way back down. Taken from my little rock enclosure. He rehashed his experience with me. The first bit of the cables was pretty easy, but suddenly the trail gets very steep and you are no longer holding cables at waist height, but instead at head height. And oh, by the way, this portion of the granite monolith felt like polished marble from all the feet traversing it every day. He said that he would try to take a few steps and just slide back down. He ended up making it somewhere between 1/3 and 1/2 of the way up the cables before turning around. A lesson learned from this is that proper footwear is definitely needed to climb the Half Dome cables. Warning sign at the top of the subdome. Nick’s view from the top of the subdome. You can see people in the distance who’ve just climbed the subdome. Nick’s view of the Half Dome cables. I don’t know about you, but this doesn’t make me feel too safe. I’m sad that I didn’t at least see the cables first hand. But I can pretty much guarantee that I would not have been climbing them if I would have made it to the top of the subdome. Showing the trail to the Half Dome summit. We very slowly made our way back down the subdome and found a nice spot overlooking Yosemite Valley to eat an early lunch. While we were eating Nick said to me, “I didn’t want to tell you this beforehand, but..” and proceeds to tell me that one of his friends brothers actually saw someone fall off the cables while climbing. Great. Definitely glad he didn’t tell me beforehand. 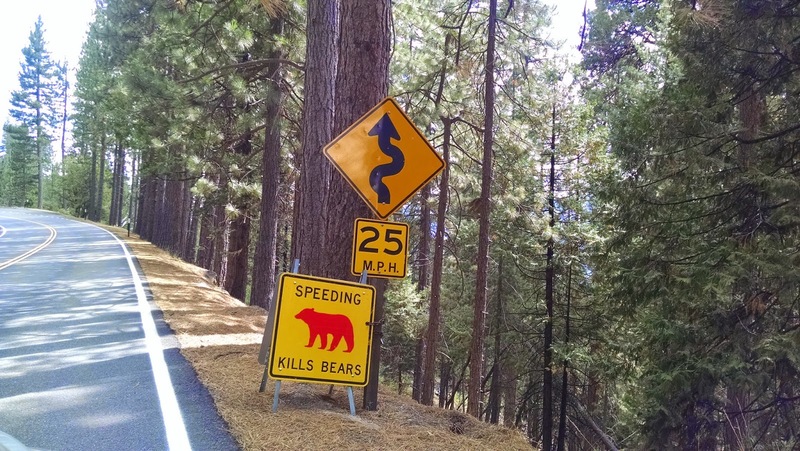 The first few miles of the climb back down to Yosemite Valley were pretty uneventful. We passed a lot of people in those few miles heading to Half Dome. Again, really thankful we left as early as we did. It felt like we had the trail to ourselves during our journey up because we saw so few people. As we passed back through Little Yosemite Valley we saw a caravan of horses transporting supplies from the Merced Lake High Sierra Camp back down to Yosemite Valley. Packing supplies out of the High Sierra Camp. The next stop on our hike back to Yosemite Valley was the top of Nevada Falls. As you might recall, we missed this on the way up to Half Dome because of where the trail diverges. We sat here with our feet in the water leading into Nevada Falls. Water under the Nevada Falls bridge. Water going over Nevada Falls. Looking straight down Nevada Falls. From the top of Nevada Falls we planned to follow the John Muir Trail back to Yosemite Valley. The trail was longer than the Mist Trail, but is slightly easier. 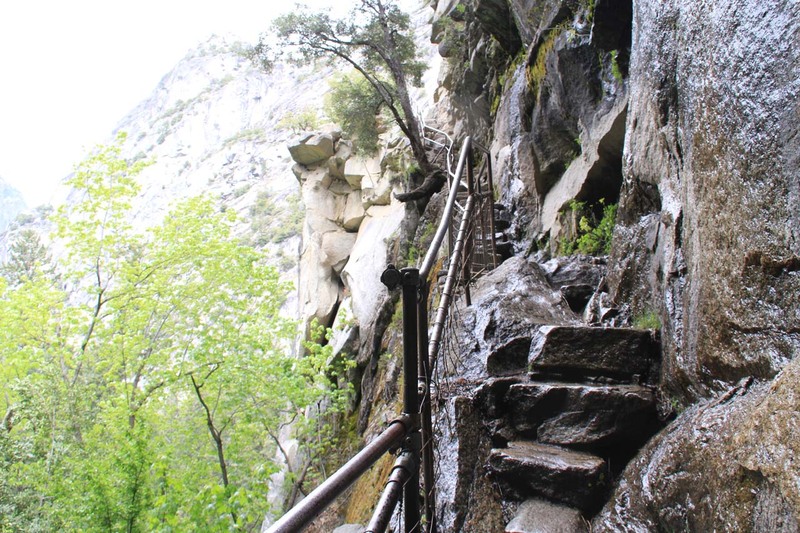 The Mist Trail would require walking down the same steep granite stairs we took at the beginning of our hike. I definitely did not want to do that. 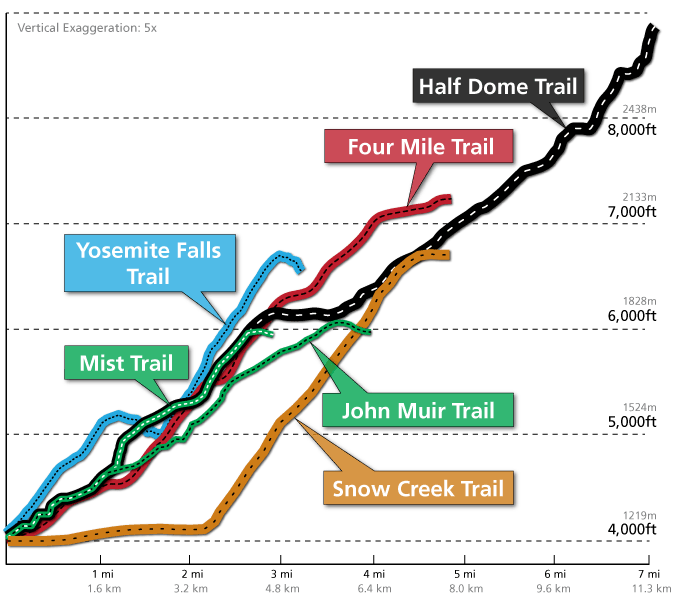 I had hoped that the John Muir Trail would be runnable– or at least have runnable sections. I was disappoint to find that the John Muir Trail was not very runnable at all. It was easier than climbing steep granite steps, but there were plenty of other rocks to contend with. View of Nevada Falls from the John Muir Trail. Another view of Nevada Falls. I must admit at this point that I was tired, the blisters on my feet were screaming, and I was pretty sure I was missing at least one toe nail. I was in pain. And every downward step I took made it worse. Those last 3 miles were miserable. I look like I feel miserable in this photo. Even feeling miserable, you can’t not enjoy the beautiful view in front of you. Still 2.3 mi to go! Starting to think the Mist Trail would have been a better option..
Once we reached the Vernal Falls footbridge there were sooo many people around. I was crabby because I was in pain, and there were tourists playing in the water and walking 3 or 4 wide on a paved trail meant for one person going each direction. It’s also worth mentioning here that this last 0.8 mi of the trail is really steep. It was tough to walk down. We ended up running it for a few reasons– to get away from the people quicker, and to lessen the impact on my blistered feet. Finally, we’re back in the valley! We finally made it back to Yosemite Valley! The hike to Half Dome was incredible. The entire experience of starting the hike in the dark at 5:00am, feeling like we had the trail to ourselves, being so close to waterfalls that you could feel the mist, attempting to climb the subdome, and discovering how far I could push myself all made for an experience I won’t forget. If you have any specific questions, or want to hear more about the hike to Half Dome, feel free to leave me a message in the comments! I’d also love to hear about your Half Dome experience as well!